There’s an interesting word that is used a lot in the workplace, but not only. Originally, it’s a verb: impiegare (to use, to employ, to spend time), to invest. But as often happens, the past participle of a verb becomes an adjective and/or noun, in this case: impiegato. We might use the past participle when we refer to time or energy spent or used for something. 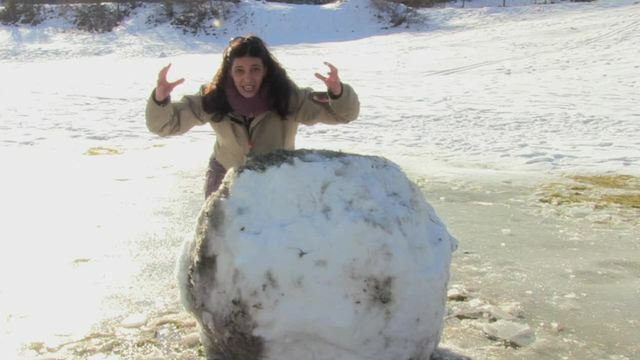 In the following example, Francesca has made a big snowball. Admittedly, it has nothing to do with the workplace, but it has to do with spending time doing something. Ah, che fatica, amici! Ho veramente impiegato molto tempo e molta energia per creare questa enorme palla di neve, che somiglia quasi a una slavina. Oh, what a job, friends! I truly spent a lot of time, and lots of energy creating this enormous snowball, which almost resembles an avalanche. Just as we can use the verb “to employ” to mean “to use” or “to hire” in English, Italian uses impiegare in much the same way. Ho impiegato questo coltello come cacciavite. I employed this knife as a screwdriver. When referring to an office situation, we often use impiegato (the past participle of the verb impiegare) as a noun. Un impiegato is an employee or clerk in some kind of office, whereas “employee” in English is a bit more general. Susanna lavora come impiegata nell’azienda di suo padre. Susanna works as a clerk/office worker in her father’s company. Suo fratello invece è operaio. Her brother is a worker, on the other hand. The following example is from a Totò comedy film. Ma un giorno mi farete vostra sposa? But one day will you make me your bride? Mia sposa? No, non posso. Come oso sposare voi, un umile impiegato morto di fame e sempre squattrinato. My bride? No, I can't. How dare I marry you, [me] a humble, starving employee/office worker and always penniless. We can also use the noun un impiego (a job, a post, employment). Il Centro per l’impiego is a center for finding employment when you are unemployed. To collect unemployment, you have to go there to prove you are looking for a job. When we use the term operaio, it usually implies manual labor, in a factory or on a site, but not in an office, not at a desk. Questi pettini vengono utilizzati dagli operai per scuotere le foglie e le olive stesse. These combs are used by workers to shake down the leaves and the olives themselves. Another word commonly used to mean “employee” is dipendente. It looks like “dependent,” and in fact, it implies that someone works for someone else and is dependent on them for his or her monthly or weekly paycheck. A business may have ten employees: dieci dipendenti. They may have different roles. Some may be operai, some may be impiegati, but they all work for il capo (the boss) and are called dipendenti. Nel mese di dicembre, chi è lavoratore dipendente, riceve la cosiddetta tredicesima, quindi uno stipendio ulteriore a quegli [sic] presi precedentemente. In the month of December, those that are hired employees, receive the so-called thirteenth, that is, a paycheck in addition to the one already received. In the above example, dipendente is used as an adjective, but it is very often used as a noun: un dipendente, più dipendenti. Some people have the security of a regular paycheck and a Christmas bonus: la tredicesima, an “extra, thirteenth” paycheck at Christmastime. They are lavoratori dipendenti ordipendenti. Others are lavoratori autonomi (self-employed workers). They have to drum up work, make out invoices, and get paid by their clients. We’ll talk about the paycheck itself in a future lesson. There is more to a paycheck than just the money you take home.